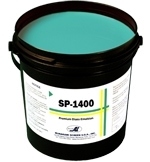 Murakami SP-1400 - RC Screen Shop & Supply Co.
SP-1400 Diazo Emulsion is one of Murakami’s newest emulsions. SKU: MKS-SP1400. Categories: Emulsions & Accessories, Murakami. Tags: murakami, water resistant, Diazo, emulsion. SP-1400 Diazo Emulsion is one of Murakami’s newest emulsions. It has all the quality that our other emulsions are famous for; fine resolution, great definition and outstanding durability. Easy to coat, develop and reclaim. SP-1400 is a production super star capable of long runs.